A premade bug out bag can be a good option for someone who wants to prepare for the unforeseen but does not have the time or knowledge to piece one together item by item. Premade bug out bags can also be used as a foundation to build upon by replacing or adding items that suit your local geography, climate, and personal needs. 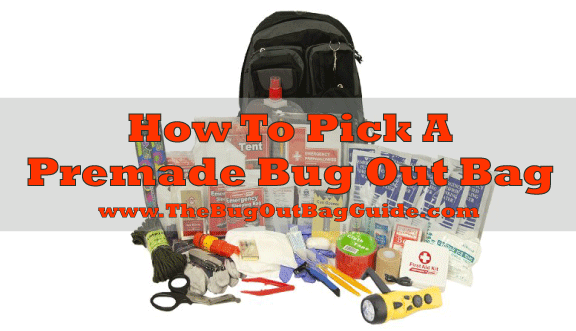 In this guide, we will discuss the advantages and disadvantages of premade bug out bags. We’ll also take a look at some of the best premade bug out bags that are currently available for sale on the market. If you’d like to build a custom bug out bag from the ground up, refer to our bug out bag list for a comprehensive look at what to pack. Does it include all the bug out bag essentials? How many additional items will I need to tailor it for urban survival or wilderness survival? Am I paying for items that I do not need? Is this for my home or to be stored in my car? Will it be easy to carry over long distances? Do the quality of the bag itself and the included gear meet my expectations? Is the bug out bag designed to cover the number of people I require? Convenience – Premade bug out bags are an “off the shelf” solution that requires minimal time or effort. Expertise – The creators of these bags have usually put some serious thought into what survival tools and supplies they decide to include. Basic needs covered – Most premade bug out bags are at least adequate for basic survival, therefore, are a good starting point. One Size Fits All – Buying a premade bug out bag is a one size fits all solution that isn’t a good choice if you are the type of person that wants to build their bag from the ground up. Unnecessary items – Depending on what is included in the premade bug out bag, you may be paying for some survival supplies that you don’t need or want. 2 Excellent kit in a discreet backpack. Comes with a good first aid kit, emergency radio, multitool, food, water, and more. 2 Good basic kit with a lot of bonus features that you do not get with the cheaper ones such as a hand powered flashlight, hygiene items, and ample water. 2 Good basic kit that will be a great foundation to customize and build upon as the bag is designed with additional space to put your personal items in. It includes an emergency shelter, hand powered flashlight, and water purification tablets, which are useful items that not every basic level kit gives you. 2 Good basic kit. Quality of items is in line with the modest price. Some items may be worth upgrading. After reviewing dozens of premade bug out bags, our favorite is the Emergency Zone Bug Out Bag Emergency Disaster Kit for Two. This premade bug out bag is packed with all the essentials survival items that you would need in an emergency. The quality of both the bag itself and its contents are among the best we have seen while remaining very reasonably priced. The black, discrete backpack is meant to look like an ordinary backpack to help you blend. Inside the kit, you will find supplies that will help you meet the basic needs of 2 people for up to 72 hours or 1 person for 144 hours. The backpack has plenty of extra room for adding personal items such as extra clothing and for customizing the kit further by packing additional survival items. Also included is a 50-page Emergency Preparedness Guidebook that will help you prepare for any disaster. This kit was obviously designed by true survivalists. It is an effective ready-to-go option to ensure that you are prepared for an emergency evacuation. If you are looking for a bug out bag to keep in your home, your car, or at work for bugging out in an emergency, this bug out bag is the kit for you! We co-developed, along with the guys at Ready To Go Survival, a bug out bag that is geared specifically for urban survival. We call it The Ultimate Urban Survival Kit (TUUSK). We tested dozens of items to see what would be best suited to help us survive an urban disaster. We tested all the gear in real world conditions in the heart of New York City and are confident that the final TUUSK loadout is ideal for surviving in an urban emergency scenario. Don’t want to build your bug out bag yourself? Have a team of Preparedness Specialists outline all the essentials you and your family will need given your group size, age, location, survival concerns, and other key factors. We’ve teamed up with the incredible team at Ready To Go Survival to offer you their personalized survival kit service. Ready To Go Survival has been in business since 2013 crafting high-end comprehensive premade survival kits. They have been featured in the New York Times, Fox News, The Daily Beast, Drudge Report, and the HBO series High Maintenance for the unique service they provide. Click HERE to learn more about the Ready To Go Survival Personalized Survival Kit Service.